While classical music today isn’t as popular as it was in the 17th century, many people still learn about famous composers and their works as they go through school. Even after school, though, some people develop a lifelong love and appreciation of these old works. If you play the church organ, perhaps you have even played a few famous pieces yourself! 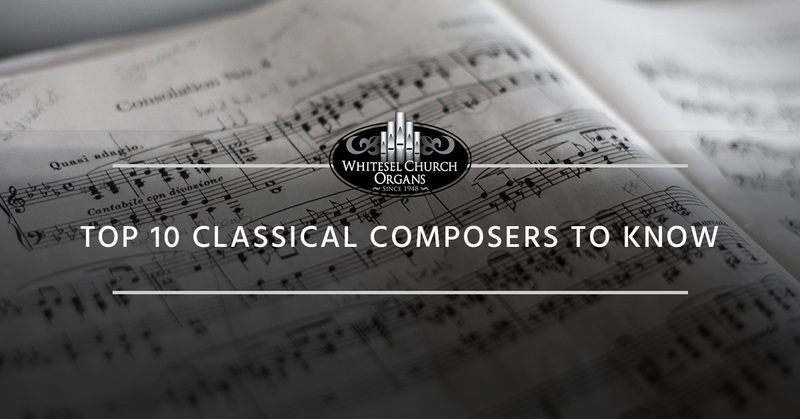 Today, we would like to share a bit about some of the most popular composers of all time. Read on to learn more from Whitesel Church Organs! Bach is considered to be one of the best classical composers to ever live. This German violist, violinist, organist, and composer was well known during his lifetime, but perhaps he is even better known now. From cantatas to arias, chorales to oratorios, organ works to concertos, we contribute over 1100 classical music pieces to Bach. You may recognize the Brandenburg Concertos, Toccata and Fugue in D minor, and Air on the G String. Even though he only lived to be 35, Mozart’s impact has been felt in the classical music world for hundreds of years. This Austrian composer impressed the world when he was only 5-years-old by mastering the keyboard and the violin, as well as performing for the wealthy all over Europe. With over 600 works to his name, he certainly did not waste his time or abilities. Some of his most famous pieces include Requiem, the operas The Magic Flute and The Marriage of Figaro, Piano Sonata No. 16 in C Major, Symphony No. 40, Piano Sonata No. 11, and many more! Beethoven is often considered to be the official marker of the transition between the Classical and Romantic periods. He is also, by far, one of the most famous musical composers to ever live. You will almost undoubtedly recognize his 9th Symphony, but what most people fail to realize is, he composed this after he had gone almost completely deaf. Some of his best works were produced at this time. Other noteworthy pieces include the Moonlight Sonata (Sonata No. 14), his 5th and 6th Symphonies, Bagatelle No. 25 (Für Elise), and Piano Concerto No. 5 in E-flat major, Op. 73. While you may not know his name as well as some of the others on this list, this Italian composer is best known for his operas. However, his music career was anything but easy. His wife died early on, and his second opera was a huge failure when presented it to the public. He fell into a deep depression and was about to give up entirely on composing. However, La Scala’s impresario told him he should write Nabucco—which ended up being fabulously successful. As he began to write more works, Verdi was soon known to be one of the top figures in 19th-century Italian classical music. His operas include Aida, Otello, Don Carlos, Falstaff, and La Traviata. Tchaikovsky holds the title for being one of the most famous Russian composers in a variety of genres. He wrote operas, chamber music, sacred choral music, symphonies, and even ballets. In fact, he may be best known for his ballets: The Nutcracker, Swan Lake, and the Sleeping Beauty. However, he also is known for his Serenade for Strings, First Piano Concerto No. 1 in B-flat minor, Overture 1812, and the Fantasy Overture from Romeo and Juliet. Just like Mozart, Chopin was an extremely talented child. He became known as one of the top Polish composers when he was extremely young. Because of his talents on the piano, he was named one of the top virtuoso pianists in history. Chopin also wrote almost exclusively for solo piano pieces. However, he also wrote two piano concertos and three sonatas. He has been given credit for creating the instrumental ballade and several different musical innovations that changed the way music was composed and performed in the future. You may recognize his Revolutionary Etude (Op. 10, No. 12), Funeral March (Prelude in C minor), or his Nocturne in E-flat major. This Italian composer was well known during the Baroque period, especially for his instrumental violin concertos. The Four Seasons, or Le Quattro Stagioni, is his best-known work. Overall, though, Vivaldi was responsible for composing over 500 concertos. More than half of these are for strings and solo instruments—particularly the violin. He also composed operas, choral music, chamber music, sonatas, and symphonies. You may know his choral work, Gloria. Although Verdi may be known as the top Italian composer, Puccini follows close behind. In fact, he holds the title of “the last of Italy’s great opera composers.” His operas, which include La Boheme, Tosca, Il Trittico, Turandot, and Madama Butterfly, often are still performed today in the standard repertoire. Of course, these operas contain many stand-alone arias that opera singers choose to perform today. The most famous include Mi Chiamano Mimi, Nessun Dorma, Un Bel di Vedremo, and O Mio Babino Caro. Handel is considered to be a British composer, even though he was German-born. Regardless, he is still thought of to be one of the greatest masters of the Baroque era. With over 40 operas, 29 oratories, 100 cantatas, duets, and trios, 10 organ concertos and more to his name, it’s no wonder that he is referred to as one of Britain’s foremost classical composers. His greatest works are still popular to this day: the Messiah, Music for the Royal Fireworks, and Water Music are some of the top picks. While Stravinsky was born in Russia, he then moved to France and then to America. He is considered to be one of the most outstanding 20th-century composers. Even though he is still admired all over the world for his bold and revolutionary style of composition, he stirred up quite a bit of controversy at the time! Some of his greatest and most famous works include The Rite of Spring, Oedipus Rex, the Symphony in Three Movements, and the Song of the Nightingale. If you are learning pieces from one of these famous composers, make sure you are learning on a church organ that produces the highest quality sound! Contact Whitesel Church Organs today to learn more about our organs and see how we can help you.